Thousand Island dressing is a salad dressing and condiment based on mayonnaise and can include olive oil, lemon juice, orange juice, paprika, Worcestershire sauce, mustard, vinegar, cream, chili sauce, tomato purée, ketchup, or Tabasco sauce. 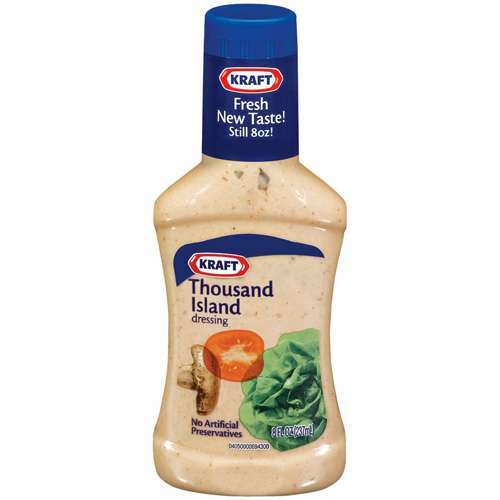 In the 1950s, Thousand Island dressing became a standard condiment, used on sandwiches and salads alike. It is widely used in fast-food restaurants and diners in America. Thousand Island dressing is also often used as an ingredient in a Reuben sandwich in place of Russian dressing. Recipes Using Thousand Islands see Here and Here.